Pinyon Pine trees are great privacy trees Utah. Native throughout most of southern, central, and eastern Utah at mid-elevations. Also throughout the southwestern U.S. They grow on dry sites, often mixed with junipers. They are shade intolerant. Pinyon Pines are extremely water efficient and require 15 inches or less of rain each year. This makes them perfect choices for Utah landscaping. Pinyon Pines grow yellow-green needles, about 2 inches long, that remain on the tree for some 8 or 9 years. The cones are small and resemble brown roses. Inside the cones you will find the treasured pine nuts. They are great options for privacy trees Utah due to their extremely bushy nature. They will provide lots of privacy so you don’t have to worry about your little ones when they’re playing in your nice yard. 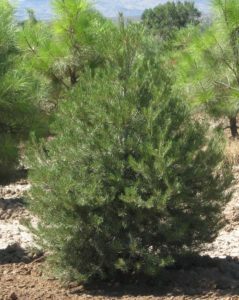 We also offer Colorado Blue Spruce, Austrian Pine, and Bristlecone Pine trees. While they are all great choices for Utah’s climate, they do serve somewhat different purposes. They are all fast growing trees, but some grow taller than others making them better choices for shade. Those that grow tallest are the Blue Spruce, followed by the Austrian Pine and then the Bristlecone Pine. Others are better for privacy, namely the Bristlecone and Blue Spruce. The Austrian Pine are layered, meaning that there are clear-cut distinctions between the layers. This generally makes them look sparser and less full than its counterparts. However, there are many that are not as layered which make them still great choices for shade or decoration in landscaping. If you’re ready to provide better privacy to your yard then now is the time to act. Call us today at (385) 257-0055 or email us by clicking here.